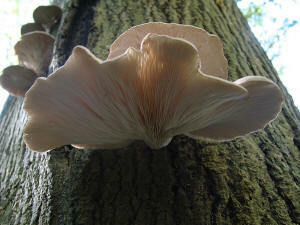 My name is Ryan Woller and this is my website dedicated to the oyster mushroom, Pleurotus ostreatus. This website is part of the MultipleOrganisms.net project created by Organismal Biology students at the University of Wisconsin - La Crosse. Pleurotus ostreatus is a popular edible mushroom that you've probably seen growing on the side of a decaying log or sauted on a cooking show. But the oyster mushroom is far more interesting than just dead trees and mushroom soup. Did you know that oyster mushrooms contain a chemical that can help lower your cholesterol? How about the unique way that oyster mushrooms obtain nutrients? There's far more to this fantastic fungus than meets the eye. Click here to learn about how oyster mushrooms are classified.